Update: Marco Rubio's scare tactics have apparently succeeded. Due to fears of being targeted by the US for helping Venezuela ship its dwindling gold reserves out of the country, the financial firm that was supposed to help the Maduro regime ship 20 tonnes of gold out of Venezuela has backed away from the deal, forcing Maduro to cancel his plans to unload the gold. Juan Guaido, the opposition leader and US-recognized President of Venezuela, has been struggling to defend Venezuela's public assets to leave them available to be used to pay for humanitarian aide for the country's long suffering population. Noor Capital, which has purchased Venezuelan gold in the past, released a statement saying it would refrain from any further purchases until after "the situation in Venezuela has stabilized." To sum up: Marco Rubio managed to browbeat a foreign firm into withholding some $850 million in badly needed cash from the Maduro regime. Meanwhile, Guaido has refused to rule out accepting military assistance from the US, once again underscoring the fact that Latin America's favorite socialist paradise is about two steps away from all-out civil war. Somewhere in Caracas, a furious Maduro is cursing the day he first heard the name "Little Marco" - and somewhere in Little Caracas (the one in Miami-Dade County), thousands of Venezuelans are pledging their political fealty to the Cuban-American former presidential contender. With embattled Venezuelan dictator Nicolas Maduro reportedly preparing to ship 20 tonnes of gold to the United Arab Emirates, opponents of his regime - including one US senator and former presidential candidate - are scrambling to try and stop him. 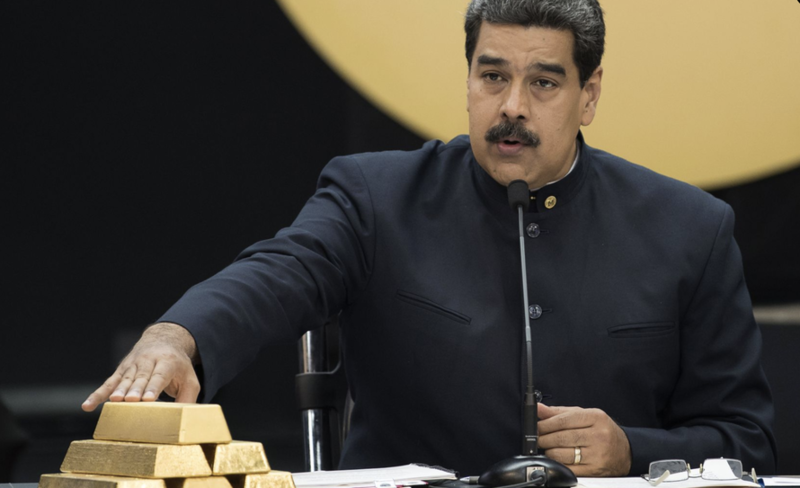 As we reported Thursday, Maduro's government reportedly shipped three tonnes of gold to the UAE last week, and, though reports on the exact number vary, he is believed to be preparing to ship another 20 tonnes in the near future. 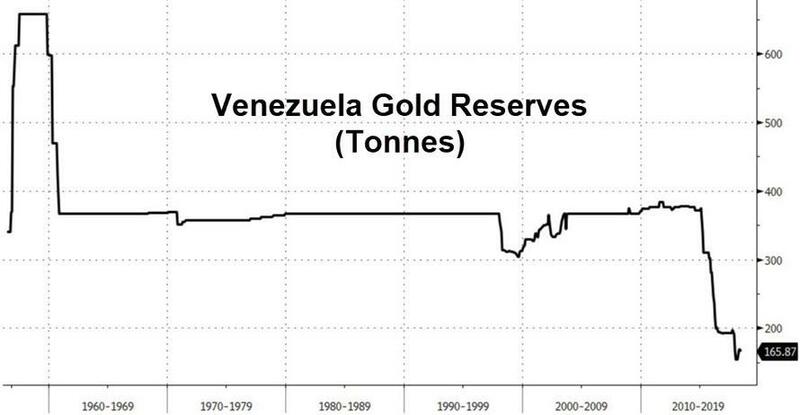 Earlier this week, a member of the Venezuelan opposition warned that a Russian jetliner had landed in Caracas, purportedly with the intent of spiriting away a hefty slice of the country's already dwindling gold reserves. But while that plane left allegedly without any gold on board, in its place another plane from Dubai landed, prompting a wave of speculation that Maduro is planning to ship more gold to the UAE, according to Bloomberg. The gold is valued at some $850 million. Taken together, the 20 tonnes of gold represent more than 10% of Venezuela's dwindling reserves. Twenty tons is a lot of gold bars - almost 1,600 of them. Together, they represent about 10 percent of all the Venezuelan central bank’s foreign reserves. Those assets form a key part of the fierce battle for control of Venezuela’s finances between Maduro and Juan Guaido, the National Assembly leader who is trying to install a transitional government with the support of the U.S. and other countries across the region. Rumors about Maduro's quest to expatriate the gold come after the Bank of England denied Maduro officials’ request to withdraw $1.2 billion of gold stored in BoE vaults after US officials intervened. But Florida Sen. Marco Rubio, who has become one of the most outspoken US officials agitating for the toppling of the Maduro regime, tweeted on Thursday that a French national working for Abu Dhabi-based Noor Capital was in Venezuela on Thursday to arrange the "theft" of more gold. He added that the firm, its employee and the airline it hired to help move the gold could be subject to US sanctions. As of Thursday evening, the gold had yet to leave the central bank, though BBG was unable to get in contact with anybody from Noor capital or Venezuela's central bank. Earlier this week, National Security Advisor John Bolton issued a similar warning to anybody seeking to deal in Venezuelan gold. Opposition leader Juan Guaido, who is now recognized as the legitimate leader of Venezuelan by roughly two dozen countries, has repeatedly emphasized his team's efforts to protect the country's remaining assets so that they can be used to offer humanitarian aide. After being harassed by Maduro's shock troops, who raided his home, an act that the US denounced as an "act of intimidation", Guaido said he would hold Maduro responsible for the safety of his daughter. Guaido most recently vowed to defy the administration's order to accept humanitarian aide by orchestrating a plan to ship large quantities of medicine into the country after the US granted him access to Venezuelan assets being kept at the New York Federal Reserve. But given the support that Maduro continues to receive from China, Russia and other allies who have invested billions of dollars in Venezeulan oil production under his rule, his regime, though weakened, is hardly on the verge of an imminent collapse.